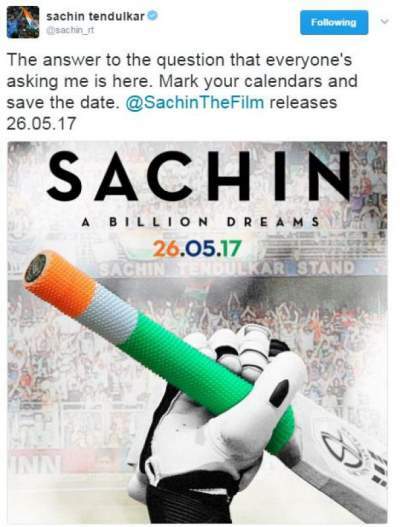 Sachin biopic release date has been announced by the master blaster Sachin Tendulkar himself. He shared the news on his official Twitter handle. ‘Sachin: A Billion Dream’ will release on May 26, 2017. The first look poster of the movie was released in April 2016. The name of his biographical film was selected after conducting a contest. The former cricketer had shared the same earlier on the micro-blogging platform. He is considered as the greatest batsman till date. He is the first batsman to score double hundred in ODIs. Debuted, at the age of 16, for India in 1989 against Pakistan, Sachin took retirement in 2013 after playing for 24 years. He is the only batsman who has scored 100 centuries in the international career. Tendulkar released his autobiography ‘Playing It My Way’ shortly after retiring from all forms of cricket. check: Raees vs Kaabil 20th Day Collection. The teaser for Sachin biopic was released last year. But, there had been a lot of buzz and curiosity around the release date. It will release a week before Akshay Kumar’s upcoming movie Toilet: Ek Prem Katha. Happy Valentine’s Day Images 2017. After the success of two cricketers’ biopics Azhar of Mohammad Azharuddin and MS Dhoni: The Untold Story, people are early waiting for the biopic of Sachin to release.